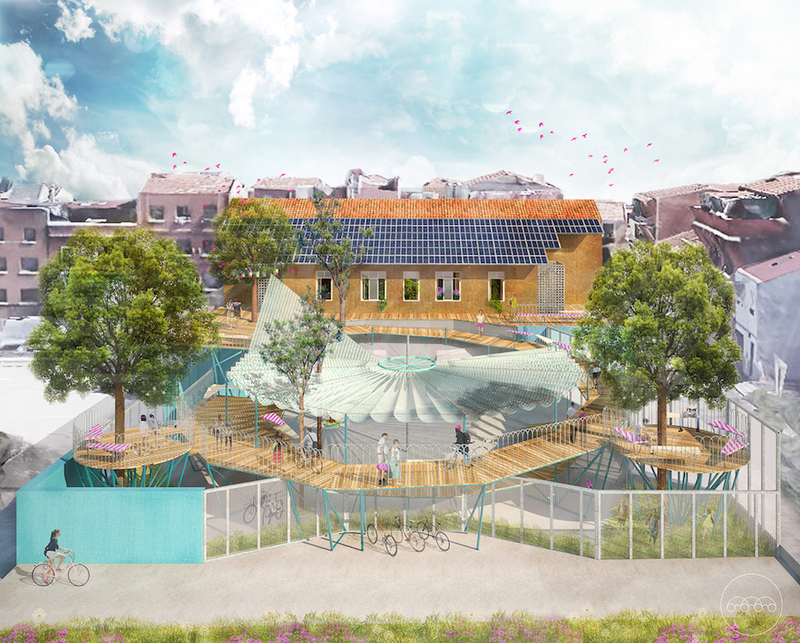 MAR Movilidad is the mobility hub of the Mares Madrid project, an initiative by the city of Madrid, co-funded by the European Union’s Urban Innovative Actions programme. Bringing together a variety of actors active in the city, from citizen initiatives, startups and social enterprises to cooperative networks and economic development organisations, Mares Madrid (an acronym referring to mobility, alimentation, recycling, energy and care or cuidados) aims at developing new economic opportunities for the social and solidarity economy around specific themes, building networks around hubs in four different neighbourhoods of Madrid. What is your role in Mares Madrid? As Vivero de Iniciativas Ciudadanas, we are one of the three entities that prepared the project, presented it to the City Hall and the Municipality agreed to partner with us to apply for the Urban Innovative Actions programme. We created a partnership that has a specific experience in social inclusion. One of the organisations we teamed up with in the beginning is Tangente, a cooperative of cooperatives that have been working together for 15 years within the field of social economy. Another organisation in the consortium, Dinamia has experience in how to develop new opportunities in enterprises to make them more inclusive. And VIC, the third founder of the initiative has been putting in the project the knowledge we have been developing in the past years, questioning formal ways of developing the city and the territory. We also invited five other organisations, including public institutions like the Agencia d’Empleo and private entities with a social focus. This is the team that is working on Mares Madrid, involving about 60-70 people who have different roles. 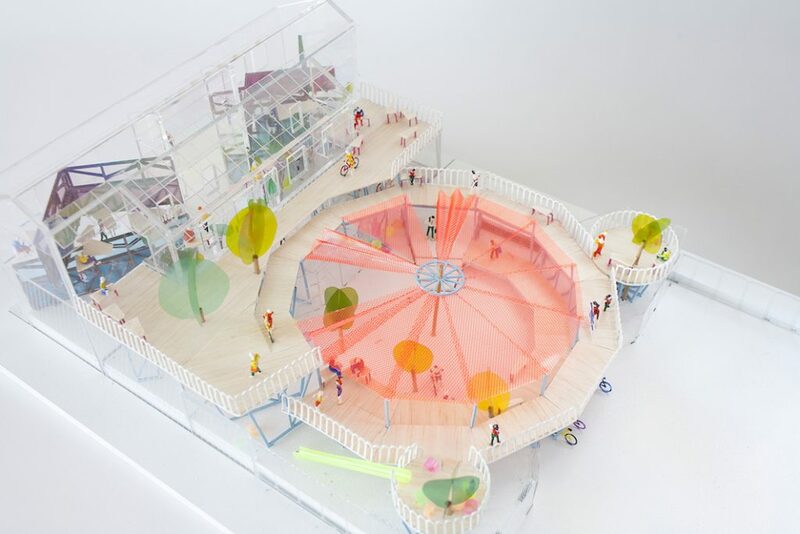 How does this project materialise in Madrid? There are four spaces in the city and there are five main issues of urban transformation. The main goal of Mares is to transform the city, focusing on a few themes and neighbourhoods, leading to economical transformation and generating economic opportunities for people linked to urban transformation. The five subjects that we are working on from the beginning are alimentation, recycling, energy, care and mobility – we are now at the mobility hub. There is a hub for each of these topics except for “care” that is a transversal theme. The objective is not to develop clusters and focus on one topic but to have points of reference that help people develop activities. If somebody here in Vallecas has an energy-related initiative and wants to develop here, from this Mar and not go to the Mar focusing on energy, we should be able to give them the support to develop their activity here. What is the role of Mar Movilidad in the overall project? It is a provisional space, not the final structure. We are starting our second week here, after almost one year of working on a strategy for each of the topics and connecting people. With the Cooperative Cambiamo, with whom we are managing this space, we chose two main lines for each topic: here within mobility, we focus on “last mile” cycling logistics and how new types of mobility can help us develop community activities on the one hand, and on technologies that allow us to move in a clean way. These are the main issues that we are focusing on here but we also work on data and other transversal topics. The question is what kind of mobility do we conceive for a globalised world? Do all the movements we do in our cities to support our urban life make sense? No: we are transporting things and because of the nature of transportation we do not focus on value and making value move to generate more value. This is not a neoliberal point of view: we have to understand value as something that is not reduced to monetary value. We have been working on identifying and mapping in all four districts citizen-based economic initiatives with whom we can cooperate. After mapping and developing these strategic axes, we needed a place where these initiatives can start working together, developing their projects individually or in a collective way. We are always focusing on developing cooperative economical practices. How does this space serve those initiatives? The initiatives need special counselling to develop their own initiatives. We have identified common concerns among them and therefore we try to deploy motor groups to develop knowledge around these concerns in a practical but also a research-based way. We are also developing learning communities: right now we are finalising the definition of the first knowledge café that we will hold here in two weeks around some specific questions and trying to identify different actors in the sector and how can we address concerns from these actors. 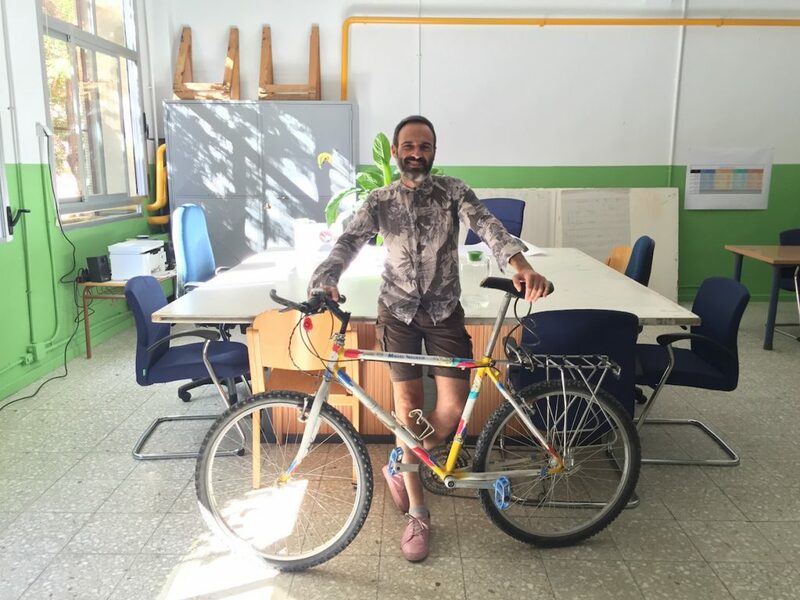 Vallecas is one of the districts in Madrid that have the strongest tradition of community activities, resistance, cycling initiatives, recycling, with a big focus on inclusiveness. Vallecas has historically been one of the most stigmatised districts in Madrid. Now that we cannot afford to live anymore in the city centre and young people are looking for places not too far from the centre, Vallecas is the new Eldorado. From the urban point of view, this area also has a high architectural quality, more than other areas in the centre that have began to transform under the new pressures of the city. How can the municipality support these initiatives? The municipality is key to reach people we could not reach otherwise. Even if criticism of politicians increases everywhere, there has been some changes in municipalities that helped politicians adapt to the needs and challenges of the present. Madrid is a good example of that, and cooperation with the municipality allows us to be able to reach big enterprises and also neighbours that otherwise would not be reactive to any call. Second, the municipality can help with resources. Third, there is the space: this building used to be a school until two years ago, it is now a hub to develop employment opportunities in different ways. It includes two different projects from the local employment agency: one for inclusion with gender-focused initiatives and the other one for developing enterprises, through a bit more traditional method. We will probably also take the kitchen and will transform it in a way that allows us to cook collectively. The fact of making different initiatives share the same space opens opportunities to make these individual initiatives better. The public realm is key: if they start to create incentives and conditions to help these initiatives, something that only they can do, the impact of those initiatives becomes bigger because of their greater reach. In the same time, bureaucracy is slow. The date when we can move to our final space has been already delayed because of bureaucratic procedures. Can the European monitoring and engagement behind Mares Madrid help us modify formal processes to make them faster? It would be important as the final space is one of the main issues. 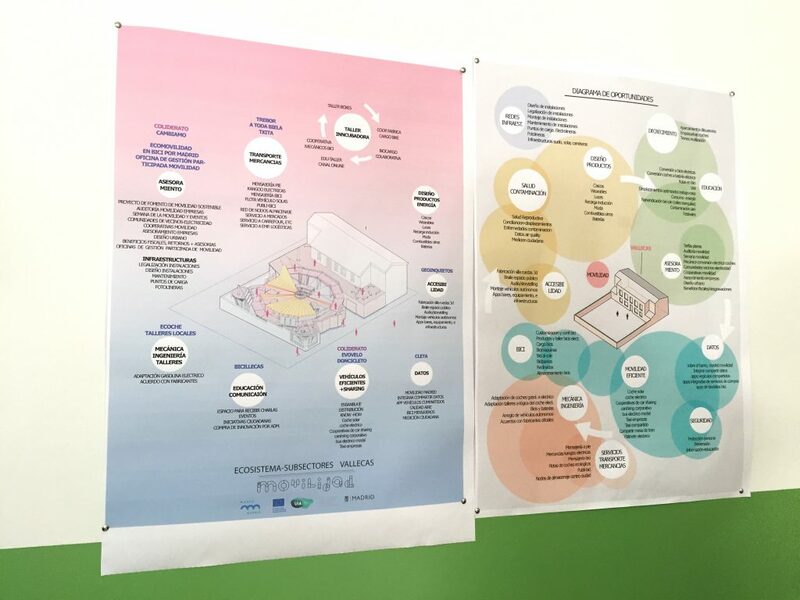 But here, in the temporary venue, we also have significant resources: it is a challenge for us to make Mar Movilidad happen here first and we can do it. The square around this building is a neighbours’ community: it is very special. Here we can open ways of working that we were not imagining in the beginning. How does your work here correspond to your work in other cities? I just came back from Mexico where I have been working with VIC, to join Mares Madrid. In Guadalajara we do not work with the same methodology as here. We developed the methodology according to what we saw in all the projects that we have been developing for the past 14 years. We started mapping Guadalajara for the first time about a year and a half ago: mapping not only what people do and who are behind the initiatives but also the challenges, the contributions they give to their members and to the outside. We are focusing a lot on impact, on ways of making impact visible, comprehensible and measurable. Our work in different cities is closely linked we exchange knowledge in both ways. Based on all the experience we gathered in different places, we understand that there are many issues that are common and there are some specificities in some places that can help find answers faster than in other places. Giving visibility to projects between separate places is mandatory. That opens many possible ways of taking on the work that people like you and us have been developing and putting them together at another stage. Economy, Madrid , circular economy, cooperative, economy, English, governance, integration, mobility, municipality, neighbourhood, network, social enterprise, social inclusion, sustainability, work.